Disclaimer: for the purpose of this opinion I refer to those who have been sexually assaulted as mainly women, and assaulters as mainly men. This is heteronormative and is not the case 100 per cent of the time, but it is most common occurrence. Today, referring to a person as a “victim” comes with boatloads of unwanted connotations. The term has transformed from meaning simply a recipient of unwanted action to meaning weak, helpless, and oftentimes, at fault. Too regularly, society paints victims of sexual assault—90 per cent of whom are women, according to Statistics Canada—as helpless sacrifices to the men who have harmed them. Under the influence of this mindset, men are strong, women are weak, and women who have experienced trauma are fragile and small. The label “survivor” is not much better. Referring to someone with these experiences as a survivor implies to me that they wake up every morning listening to the smash hit by Destiny’s Child, feeling like Beyoncé as they don their “I’m a powerful woman” cape and face the day. Nothing bothers them anymore. When the world ends, they will outlast all those who have wronged them like a badass cockroach. They’re over it. 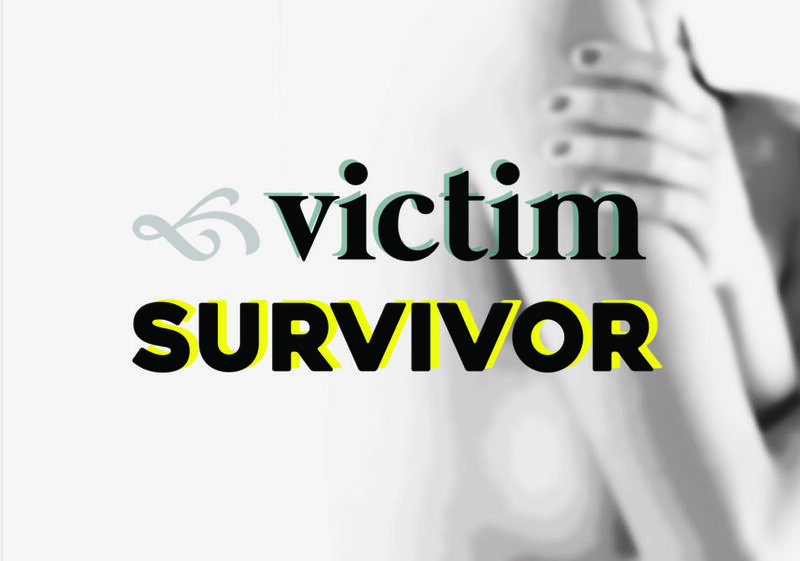 Like “victim”, “survivor” describes a person, not an event. It’s as if all they are now is a survivor, not a woman, not an individual—just the product of a man’s act. There is of course a hint of truth behind both terms. Some may identify with the term victim, and many women are reclaiming the word, which is important to acknowledge. Others may find “survivor” to be empowering, which is also important. The problem with terms like these being used broadly, however, is that they imply women have to feel like they’re either one or the other. The website Good Therapy describes the process of overcoming sexual assault as similar to the five stages of grief. It says that after an assault, the recipient will go through three stages: victim, survivor, and finally thriver. In the victim stage, one will be “vulnerable” and “self-destructive”, and might “want to hide or be rescued.” The survivor phase is “not necessarily a happy phase of life,” but happiness now takes place from time to time, while the thriver stage ultimately “crystalizes” that progress. Those three stages cannot encapsulate how everybody heals. Not everyone heals the same way, and terms and step-by-step guides like this put a lot of pressure on people who have had horrible experiences—who are possibly feeling like outsiders or feeling guilty for things that are out of their control—to heal how society tells them to. “Complainant” seems like a potential alternative term, but it may be a bit too desensitizing and judicial. Saying the full phrase, “person who has been on the receiving end of unwanted sexual acts,” also feels too diplomatic, and doesn’t make for very snappy headlines. I’m now kind of in favour of “badass cockroach” because it sounds pretty cool, but is obviously problematic. An appropriate term, whatever it may be, would show respect to women who have been disrespected enough already. It would be something that doesn’t suggest any sort of healing process or tells them how to feel. It should be empowering to them without giving power to the assault or implying that one event could soil someone’s whole being. There is no perfect word for this that I have found yet. Someone needs to get Shakespeare on the phone to invent a new one.